Do you currently own a home? Have you ever thought about making improvements to it, both to heighten the overall appeal as well as increase the value of the property? We all would love for our homes to look amazing, but in order to do this we need to spend tens of thousands of dollars, right? Wrong. There are plenty of projects that can be done for quite cheap, can increase the overall appeal of your house, and increase its value as well. If you are looking to improve the value of your house, take a look at your front yard. So often we ignore the appeal of our yard, but this is really the most important part of the house because this is what everyone sees! If the outside of your house looks like garbage, people will assume that the inside must be run down as well. So what can you do about it? Isn’t landscaping expensive? Sure, it can be, but if you get creative it can actually be fairly cheap. I have friends that own quite a few acres of land and there are shrubs and flowers everywhere. One of them discovered that just by clipping a part of one of the bushes, they can be planted and regrown in another location. The same was true for their hostas as well! To complete the landscape, you can purchase a few perennials (the bulbs) for incredibly cheap online. Now this certainly sounds expensive, but again, it doesn’t have to be. With the kitchen being one of the most important areas in the house (if you are looking to sell anyway), you should be quite interested in learning how to make it more appealing to both yourself and to others. If you have outdated cupboards, ugly walls, and appliances, don’t fret, you can still update the entire kitchen for a rather reasonable price. First of all, painting the kitchen can really give it a major facelift. If you have ugly old light switch covers, replace them – they only cost about $0.10 per cover. If your cupboards are an ugly old wood color, feel free to paint them as well. White is quite popular these days and can really brighten up the kitchen area. Now, what about those appliances? Yes, these can be a bit pricey, but there are deals out there everywhere. All you have to do is save up the cash, glue your eyes to Craigslist, the clearance retail centers, and keep your ears open everywhere you go. If you are patient, it is not unheard of to get nearly brand new appliances for half the price of retail. Many newer homes these days are sold with an unfinished basement. If you really want to improve the value of your house, start looking into what it would take to finish it off! Since it is most likely studded and wired already, all you have to do is put up some drywall, mud the seams, and paint. I understand that not everyone has the expertise to finish an entire basement on their own, but with the help of a friend or two, we should all be capable enough to hang drywall and paint. You may want to contract someone to do the mudding, but by doing all of the other work yourself, you can really save some money. 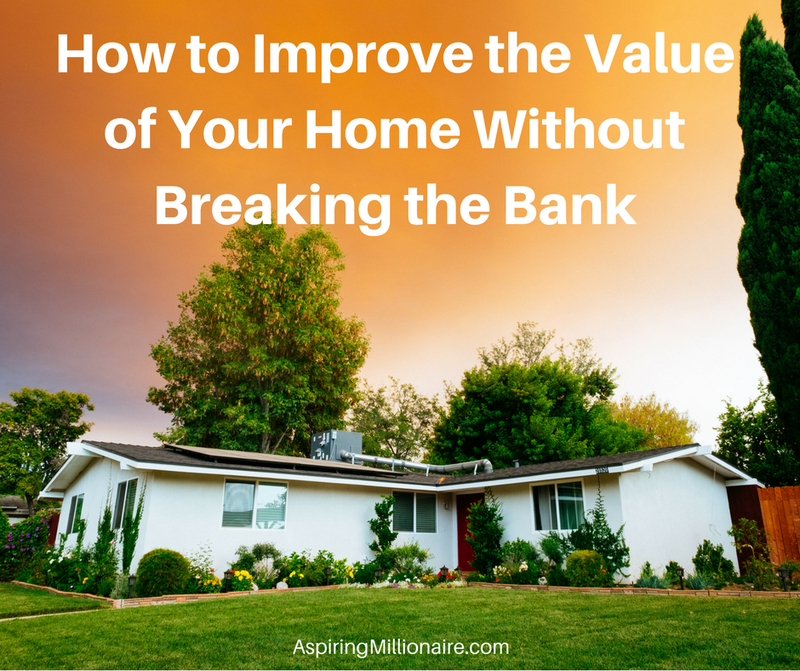 Are you ready to increase the value of your house without breaking the bank?